Captain Lakshmi Sehgal - Freedom Fighter & a Symbolic Independent Woman. 'The fight will go on' said Laxmi in 2006, to an independent videographer who was then making a documentary on Laxmi Sahgal (also written as Sehgal). “Freedom comes in three forms. The first is political emancipation from the conqueror, the second is economic [emancipation] and the third is social. India has only achieved the first.” said the Doctor-turned freedom fighter-turned doctor, former MP & social activist, Captain Laxmi Sahgal. Laxmi was born in Madras & was a rebellious child (for the good) for all that we know. She made her first (important) rebellion in Kerala at her grandmother's house. From her grandmother’s house, she would often hear the calls and hollers from the surrounding jungles and hills, of the people who in her grandmother’s words were those “whose very shadows are polluting.” The young Lakshmi one day walked up to a young tribal girl, held her hand and led her to play. Lakshmi and her grandmother were furious with each other, but Lakshmi was the one triumphant. As a kid, Laxmi saw the transformation of her mother from a Madras socialite to an ardent Congress supporter, who one day walked into her daughter’s room and took away all the child’s pretty dresses to burn in a bonfire of foreign goods. Laxmi had a deep sense of social activism & felt for helping the poor. That was one of the main reasons why she chose to study medicine & later opened a clinic for the poor, in Kanpur. As a young doctor of 26, Lakshmi left for Singapore in 1940. Three years later she would meet Subhash Chandra Bose, a meeting that would change the course of her life. “In Singapore,” Lakshmi remembered, “there were a lot of nationalist Indians like K. P. Kesava Menon, S. C. Guha, N. Raghavan, and others, who formed a Council of Action. The Japanese, however, would not give any firm commitment to the Indian National Army, nor would they say how the movement was to be expanded, how they would go into Burma, or how the fighting would take place. 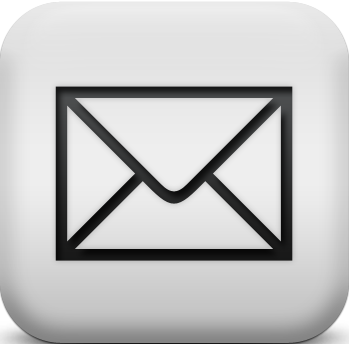 People naturally got fed up.” Bose’s arrival broke this logjam. Lakshmi, who had thus far been on the fringes of the INA, had heard that Bose was keen to draft women into the organisation. She requested a meeting with him when he arrived in Singapore, and emerged from a five-hour interview with a mandate to set up a women’s regiment, which was to be called the Rani of Jhansi regiment. There was a tremendous response from women to join the all-women brigade. Dr. Lakshmi Swaminadhan became Captain Lakshmi, a name and identity that would stay with her for life. The march to Burma began in December 1944 and, by March 1945, the decision to retreat was taken by the INA leadership, just before the entry of their armies into Imphal. Captain Lakshmi was arrested by the British army in May 1945. She remained under house arrest in the jungles of Burma until March 1946, when she was sent to India – at a time when the INA trials in Delhi were intensifying the popular hatred of colonial rule. Captain Lakshmi married Col. Prem Kumar Sehgal, a leading figure of the INA, in March 1947. The couple moved from Lahore to Kanpur, where she plunged into her medical practice, working among the flood of refugees who had come from Pakistan, and earning the trust and gratitude of both Hindus and Muslims. Captain Lakshmi was one of the founding members of AIDWA(All India Democratic Women's Association), formed in 1981. After the Bhopal gas tragedy in December 1984, she led a medical team to the city; years later she wrote a report on the long-term effects of the gas on pregnant women. During the anti-Sikh riots that followed Prime Minister Indira Gandhi’s assassination in 1984, she was out on the streets in Kanpur, confronting anti-Sikh mobs and ensuring that no Sikh or Sikh establishment in the crowded area near her clinic was attacked. She was arrested for her participation in a campaign by AIDWA against the Miss World competition held in Bangalore in 1996. Captain Sehgal was a presidential candidate in the elections of 200, the only opponent of Dr. Kalam at the time who went on to become one of the most glorious Presidents India has seen in the recent times. Captain Lakshmi had the quality of awakening a sense of joy and possibility in all who met her – her co-workers, activists of her organization, her patients, family and friends. Her life was an inextricable part of 20th and early 21st century India -- of the struggle against colonial rule, the attainment of freedom, and nation-building over 65 tumultuous years. In this great historical transition, Captain Lakshmi always positioned herself firmly on the side of the poor and underpowered. Freedom fighter, dedicated medical practitioner, and an outstanding leader of the women's movement in India, Captain Lakshmi leaves the country and its people a fine and enduring legacy. 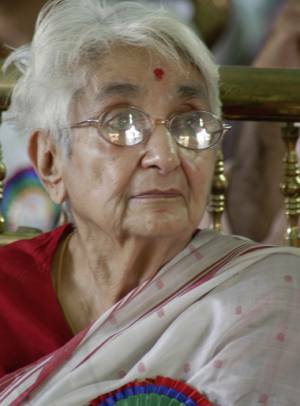 Captain Laxmi Sehgal died at the age of 97 & is survived by her daughters Subhashini Ali and Anisa Puri; her grandchildren Shaad Ali, Neha and Nishant Puri; and by her sister Mrinalini Sarabhai. 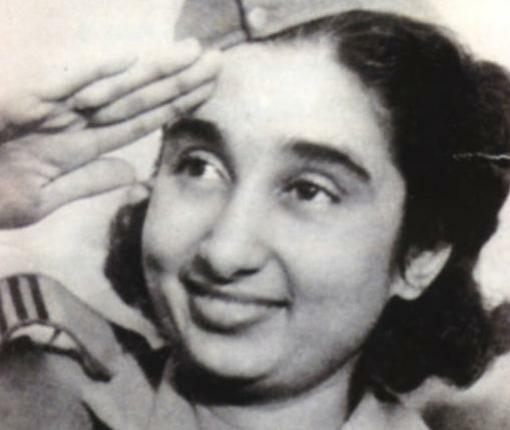 Captain Lakshmi Sahgal in Kanpur.